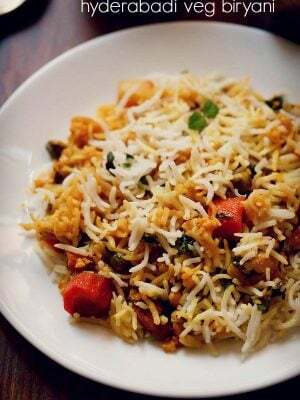 creamy, tangy and a spiced tomato and paneer based dish made without onion and garlic. 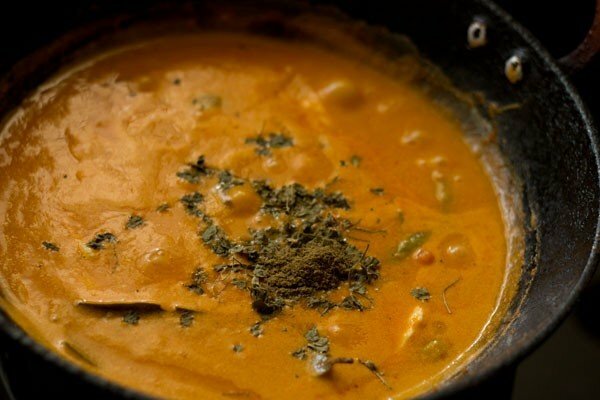 no onion no garlic paneer butter masala recipe. 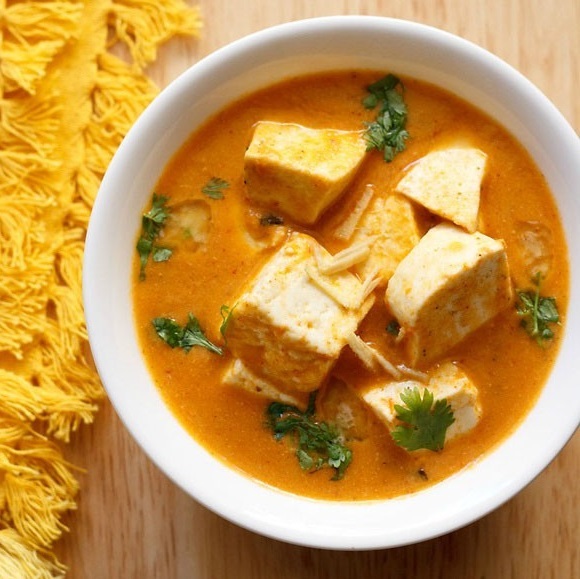 creamy, tangy and a spiced tomato and paneer based dish made without onion and garlic. 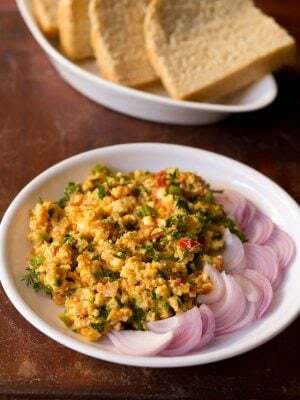 paneer is one ingredient that is liked by us and so i do make many dishes with it. 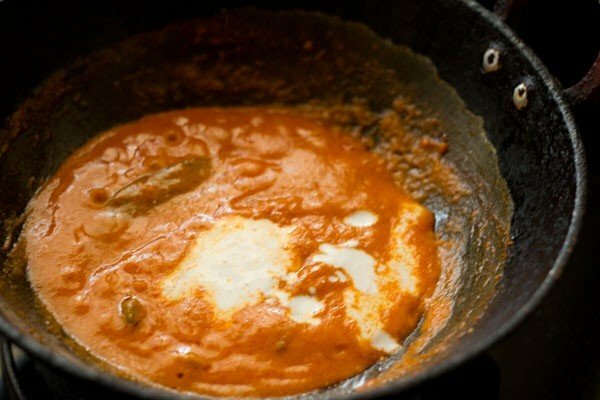 the paneer butter masala recipe i make is much appreciated at home and the recipe posted on the blog has been tried and tested my many readers. so i thought of sharing a no onion no garlic paneer butter masala too. 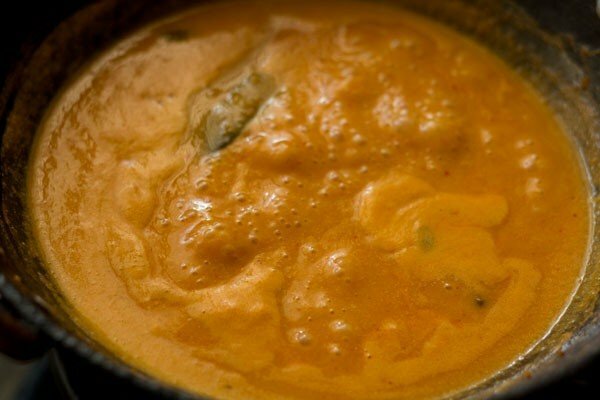 generally onions are not added to paneer butter masala gravy. 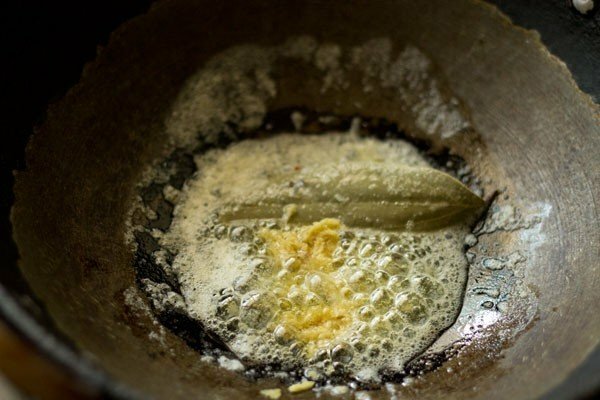 the garlic added in the form of garlic paste, does contribute towards the overall flavor of the dish. 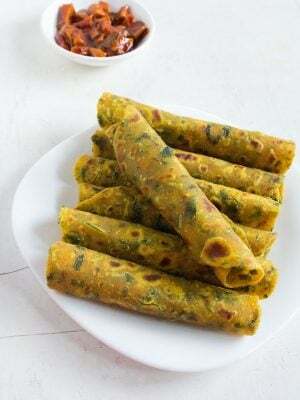 here we have used asafoetida to mimic the garlic flavor and some whole spices. 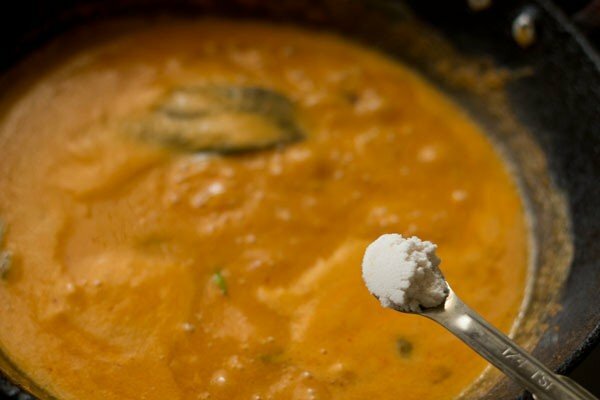 to make any butter masala or makhani gravy, you need tomatoes. and the tomatoes have to be ripe, red with a mild sweetness. avoid using tomatoes which are sour or ‘khatta’ as we call in hindi. 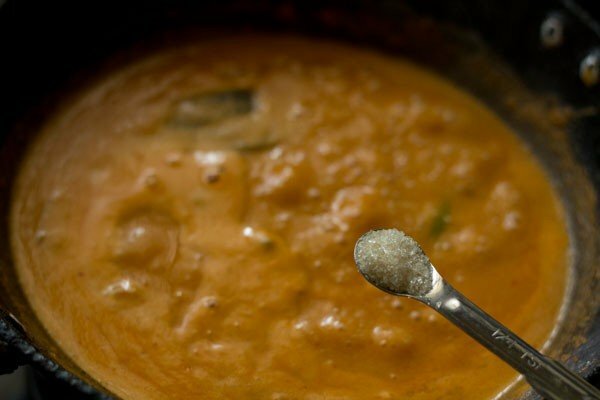 the gravy becomes sour and addition of sugar does not help much. 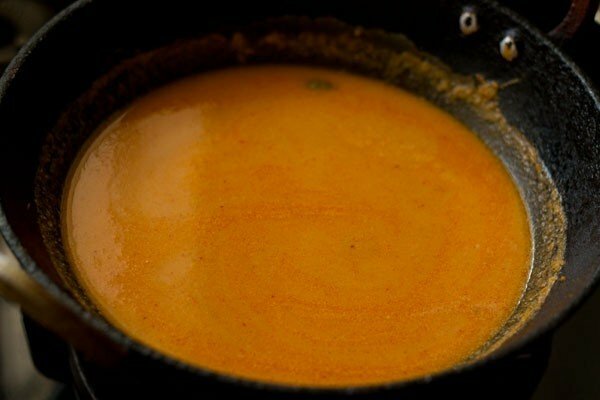 this butter masala gravy is not very heavy or rich as i have not used cream and added less cashews. if you want you can add cream. i have mentioned the proportions in the recipe instructions and step wise pics below. like all gravy dishes, paneer butter masala goes well with chapatis, tandoori rotis, naan, steamed rice or jeera rice or ghee rice or saffron rice. if you are looking for more paneer recipes then do check palak paneer, kadai paneer, paneer bhurji, paneer masala and paneer lababdar. 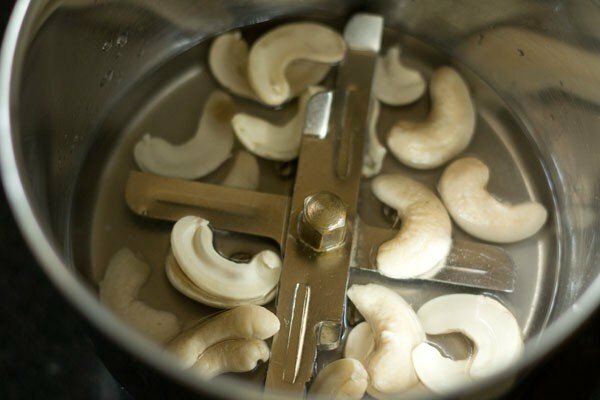 soak 12 to 15 cashews in a hot water for 20 to 30 minutes. then drain and add the soaked cashews in a blender or grinder. add 2 to 3 tbsp water and grind to a smooth paste. remove the cashew paste and keep aside. in the same blender add chopped tomatoes. blend to a smooth tomato puree. keep aside. 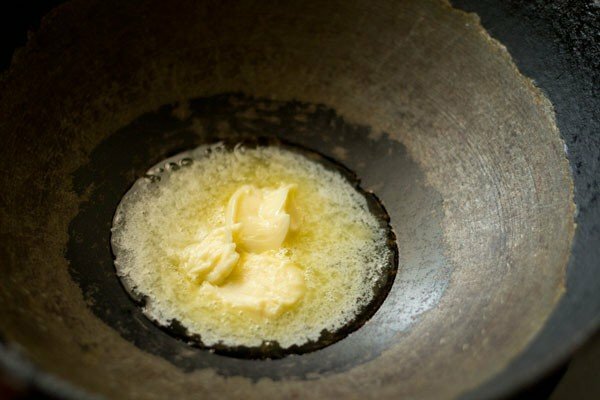 now heat 2 to 3 tbsp butter in a pan or kadai. then add the whole spices mentioned above in the ingredient list. saute the spices till they become fragrant. add ginger paste and saute the ginger paste till the raw aroma of ginger goes away. add the prepared tomato puree. stir very well and simmer for 3 minutes. then add 1 tsp kashmiri red chili powder. stir and saute the tomato paste till you see fat releasing from the sides and top. then add the cashew paste. 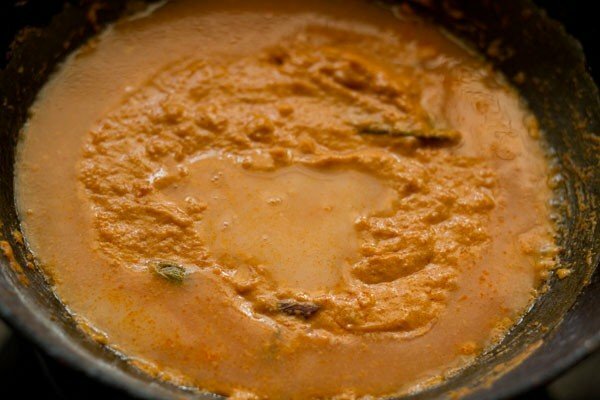 begin to stir and mix the cashew paste very well with the tomato paste. continue to saute on a low to medium flame, till you see specks of fat on the sides or on the top. then add water and stir very well. bring the gravy to a boil and then add ginger julienne and slit green chilies. season with salt. check the taste and add sugar as required. i added 1/4 tsp sugar. 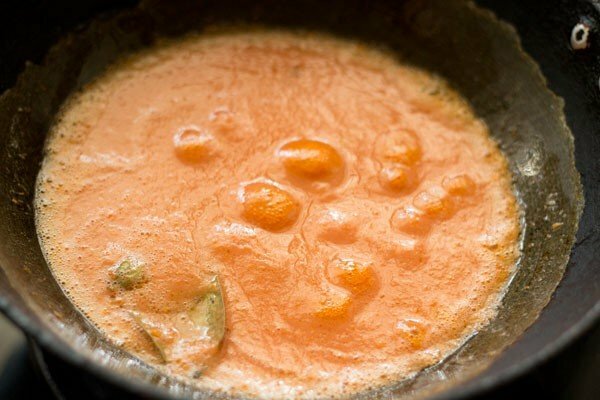 you can add from 1/4 tsp to 1 tsp depending on sourness or 'khatas' of the tomatoes. when butter masala gravy thickens a bit and you see fat specks on the top, then add paneer cubes. simmer for a minute. now add crushed kasuri methi and garam masala powder. 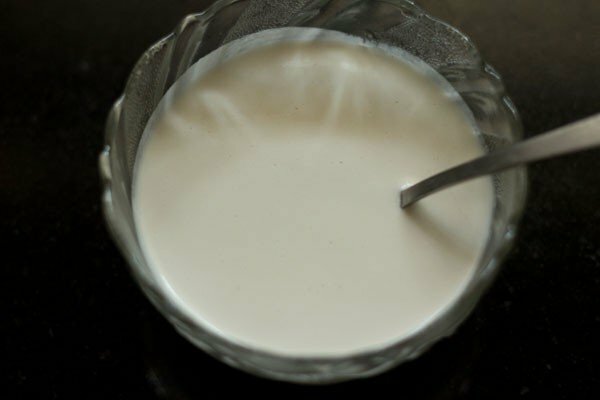 at this step, if you want you can add 2 to 3 tbsp of low fat cream or 1 to 2 tbsp of whipping cream. stir and switch off the flame. 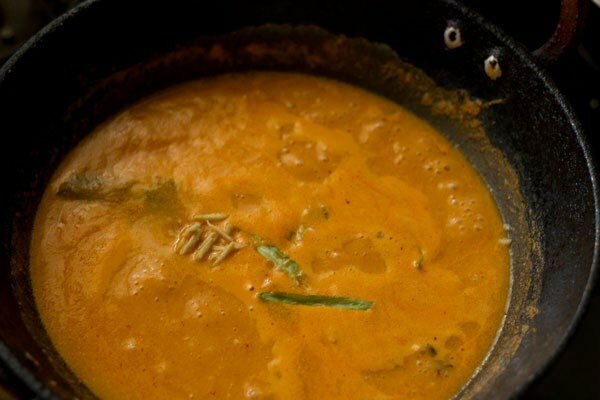 garnish this no onion no garlic paneer butter masala with chopped coriander leaves. 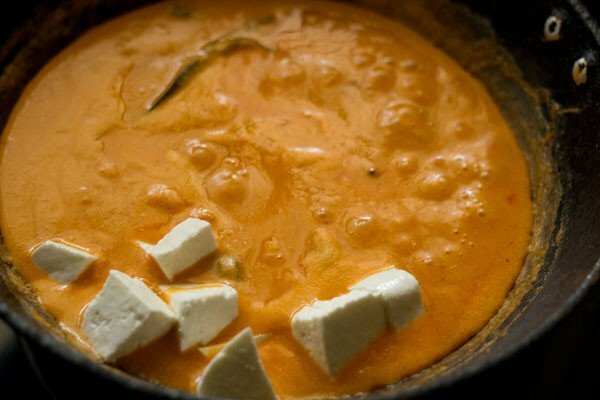 serve paneer butter masala with chapatis, rotis, steamed rice or jeera rice. 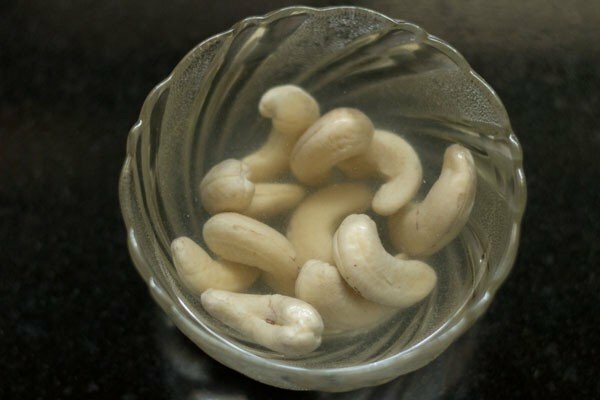 1. soak 12 to 15 cashews in a hot water for 20 to 30 minutes. when the cashews are soaking, you can prep the other ingredients like chopping tomatoes, slicing paneer etc. 2. then drain and add the soaked cashews in a blender or grinder. 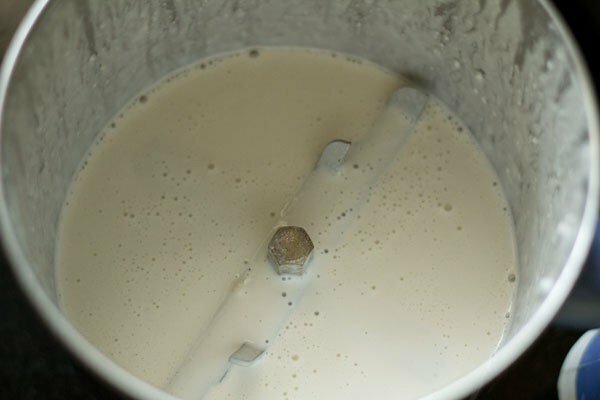 3. add 2 to 3 tbsp water and grind to a smooth paste without any tiny bits or pieces of cashews. 4. remove the cashew paste and keep aside. 5. in the same blender add 2 cups of diced or roughly chopped tomatoes. no need to blanch the tomatoes before blending. 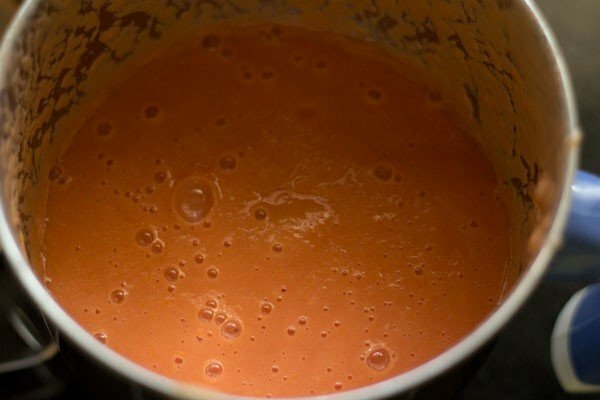 6. blend to a smooth tomato puree. keep aside. don’t add any water while blending the tomatoes. 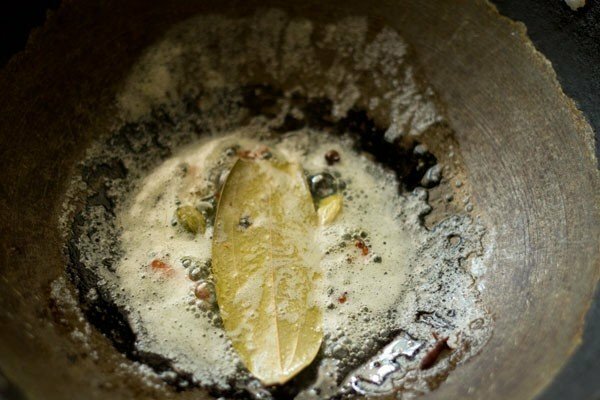 7. now heat 2 to 3 tbsp butter in a pan or kadai. 8. allow the butter to melt. 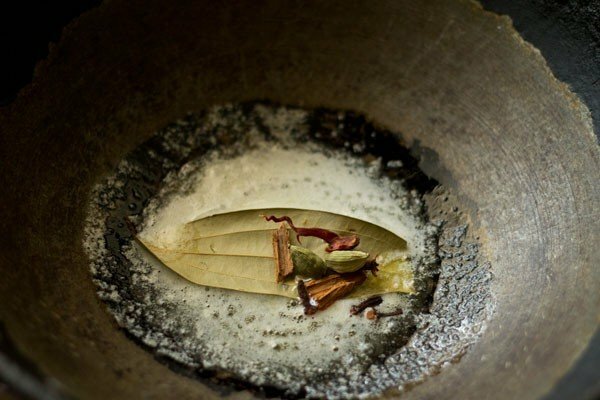 9. then add the following spices – 1 tejpatta (indian bay leaf), 2 to 3 cloves, ½ inch cinnamon, 2 green cardamoms, 1 single strand of mace and a pinch of asafoetida (hing). 10. saute the spices till they become fragrant. 11. add ½ tsp ginger paste. stir and saute the ginger paste till the raw aroma of ginger goes away. 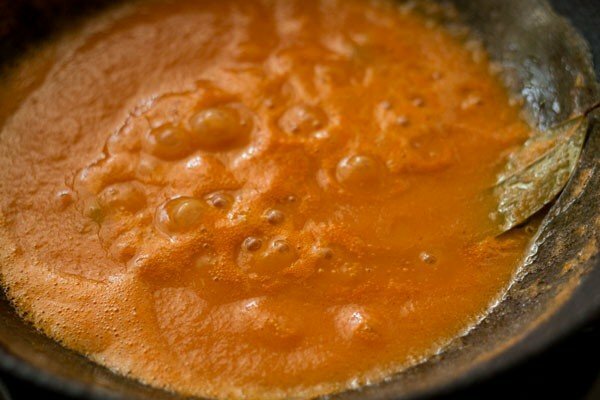 12. add the prepared tomato puree. 13. stir very well and simmer for 3 mins. if the mixture splutters, then just cover the pan or kadai partly with a lid. 14. then add 1 tsp kashmiri red chili powder or deghi mirch. 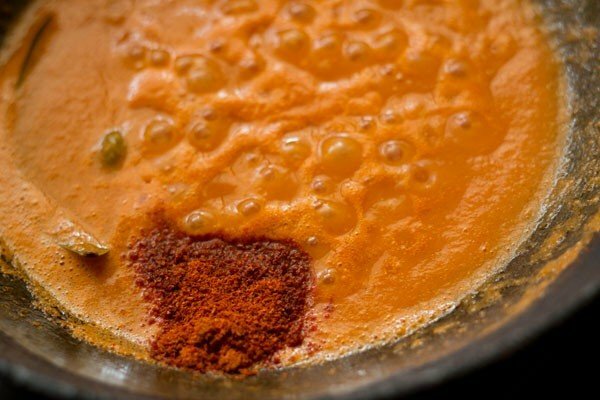 if using any other red chili powder, use ½ tsp of it. 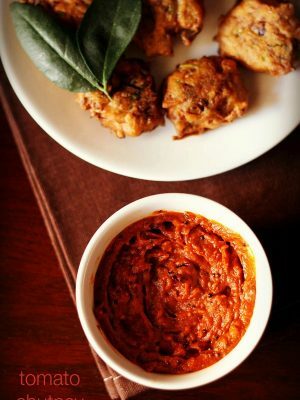 15. stir and then saute the tomato paste till you see fat releasing from the sides and top. 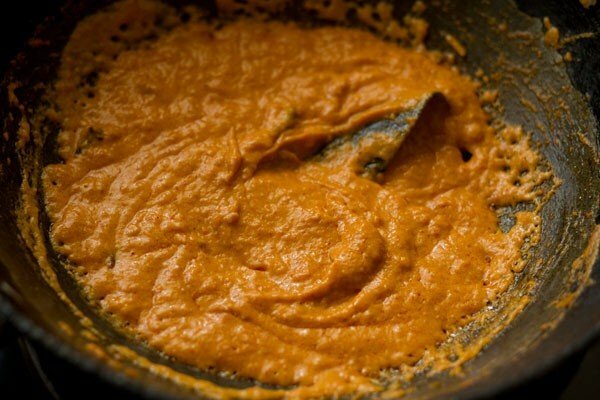 16. then the cashew paste. 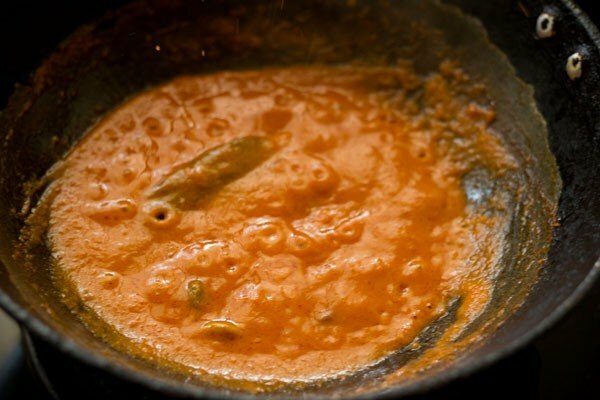 17. begin to stir and mix the cashew paste very well with the tomato paste. 18. continue to saute on a low to medium flame. 19. saute till you see fat specks on the sides or on the top. the masala paste would also reduce. 20. then add 1.25 cups water. for a thick consistency, you can add 1 cup water. 21. again stir very well. 22. bring the gravy to a boil and then add ginger julienne (½ inch ginger, julienne) and slit green chilies ( 1 green chili, slit). 24. check the taste and add sugar as required. i added ¼ tsp sugar. 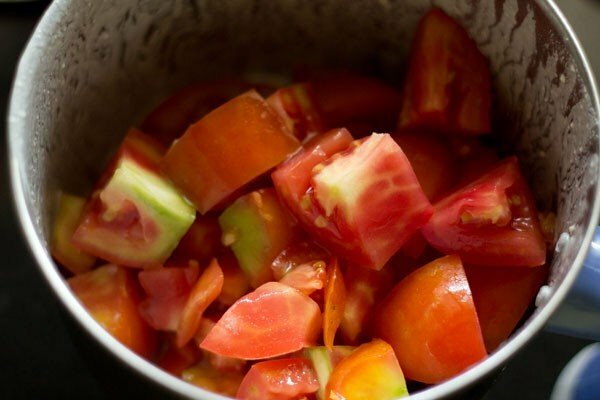 you can add from ¼ tsp to 1 tsp depending on sourness or ‘khattas’ of the tomatoes. 25. when the gravy thickens a bit and you see fat specks on the top, its time to proceed to the next step. 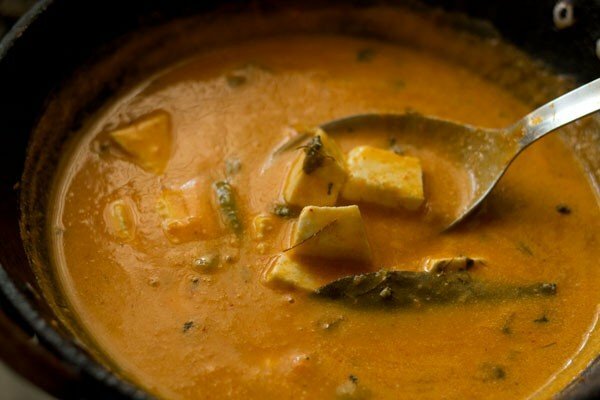 26. add paneer cubes. simmer for a minute. 27. then add 1 tsp kasuri methi (crushed) and ½ tsp garam masala powder. at this step, if you want you can add 2 to 3 tbsp of low fat cream or 1 to 2 tbsp of whipping cream. 28. stir and switch off the flame. 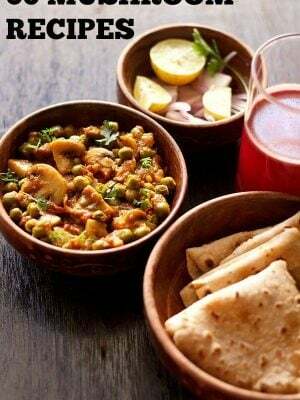 29. garnish the delicious no onion no garlic paneer butter masala with 1 to 2 tbsp chopped coriander leaves and serve with chapatis, pudina paratha, butter naan, steamed rice or jeera rice or biryani rice or garam masala rice or ghee rice. It looks so tempting… Thanks a lot.. May I know the app form of this site is online or offline..? And what’s the name of the app on playstore..? thanks. the app is online. the name of the app is vegrecipesofindia. Awesome and extremely tasty recipe. 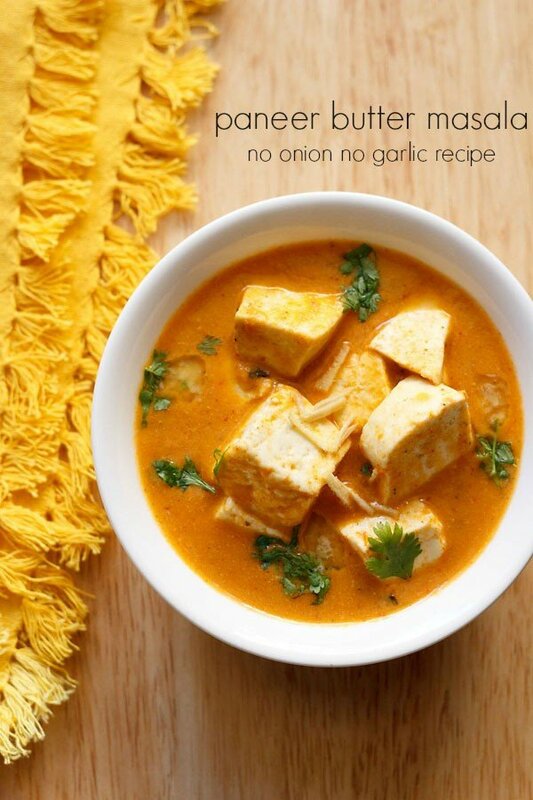 thank you ankita for this lovely feedback on paneer butter masala recipe. Can we substitute cashew with peanuts? if yes, how many tablespoons? garima, do not add peanuts. the taste will change completely. instead you can use almonds. use the same amount of almonds as cashews. 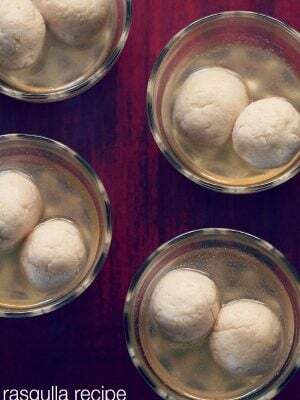 Awesome paneer recipe and worth a try for Jain foodies! thanks rupashi. glad to know that you liked the paneer butter masala recipe. happy cooking. thanks a ton. I was looking for some paneer recipe from long time because I do fast on Friday and I always have aaloo ki sabzi in dinner. but today I made paneer butter masala without onion and garlic, and it was yumm. thankyou kiran glad you liked the paneer butter masala recipe. 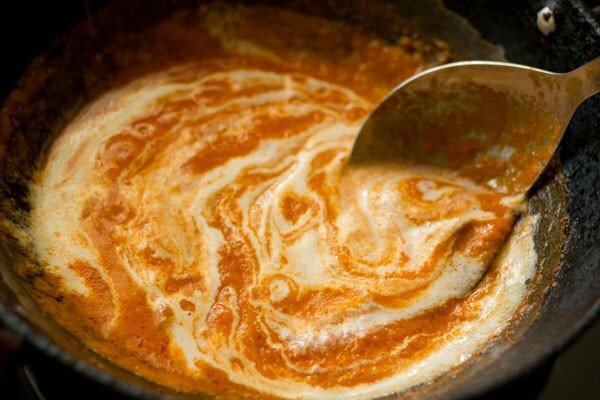 The recipe for Paneer Butter Masala without onion and garlic is simply amazing… Came out wonderful the very first time.. 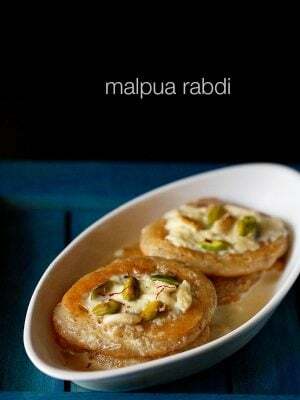 This is an awesome recipe really… It came out so well.. hats off to Dassana Amit.. In this recipe we have to fry the paneer or not ??? no need to fry the paneer. Osm I just love cooking seeing ur step by step instructions and it turns out good all the tym ! Tq ?????? welcome preethi. 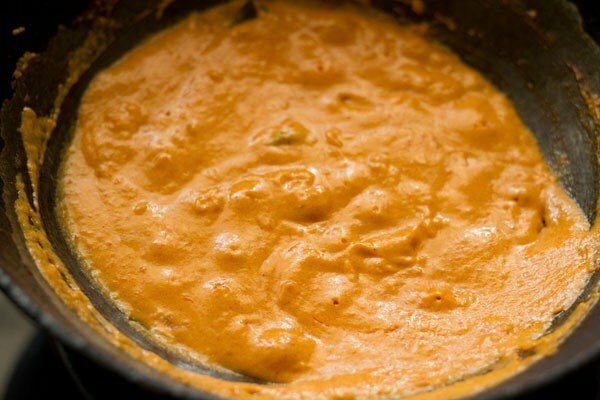 glad to know that step by step presentation helped you in cooking paneer butter masala. happy cooking. 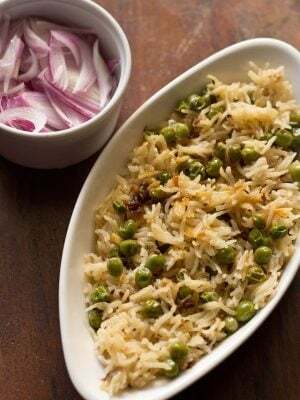 Simply superb…I prepared for my MIL as she doesn’t use onion and garlic… It really was tasty.. Thank you..
Just lovely.I’ll surely try this. mentioned in the recipe card. 4 medium tomatoes or 300 grams. Hi Dasanna, the recipe was so simple and tasted amazing.. thank you. I follow a lot of your other recipes too. They are great. thank you ! this helped me a lot. 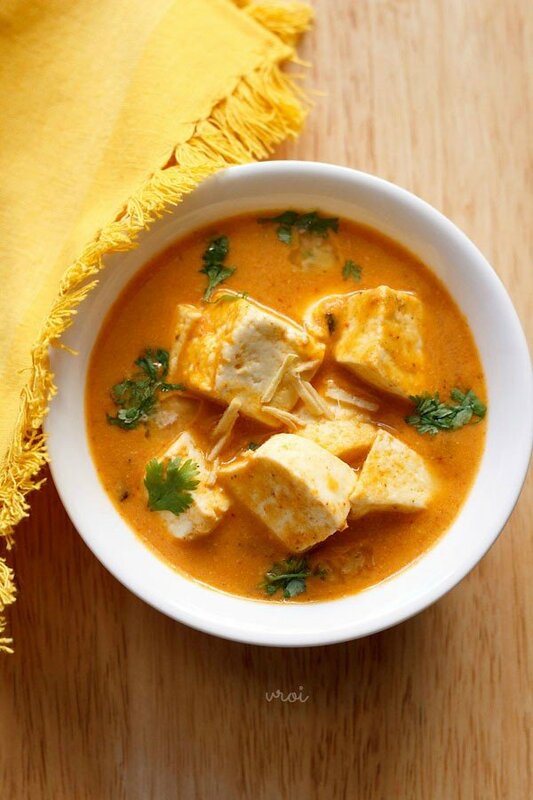 thankyou siddhi glad you liked the paneer butter masala recipe take care.